Robert Biancavilla of Eaton’s Neck lives the life of a culinary superhero – a crusading district attorney by day and artisan bread baker by night. Beginning in January 2014, his company Duck Island Bread Company offers a “bake to order” service available through the website. 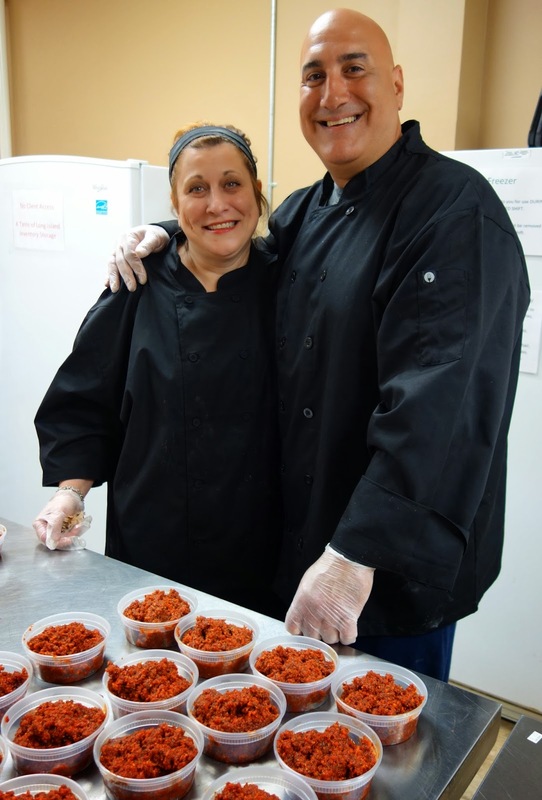 When he lost his job on Wall Street Bob Scala of Deer Park saw a business opportunity with the hugely popular fresh tomato spread he served at family gatherings and Bobby Tomatoes was born. John Gallagher of Rockville Center was unimpressed with the state of soft pretzels – so he decided to roll his own. 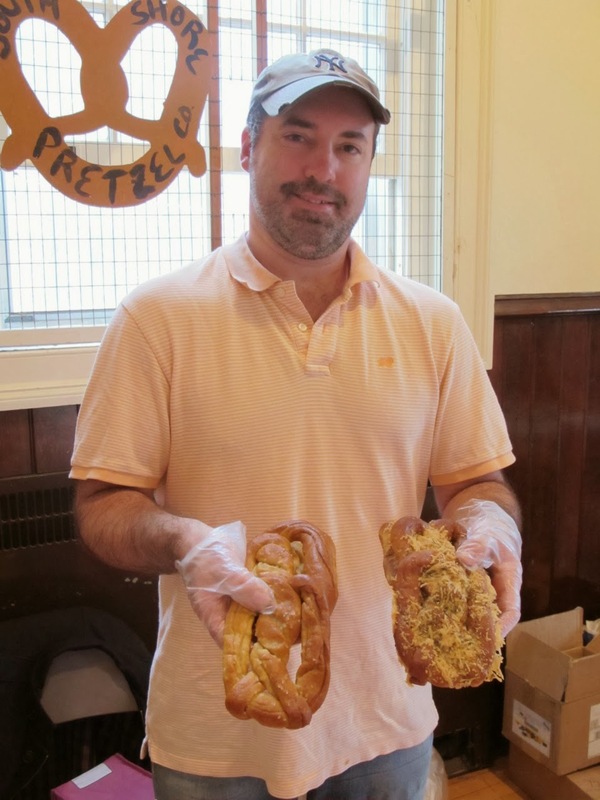 He created the South Shore Pretzel Company to sell his version of chewy, hand-rolled soft pretzels made in the German style. 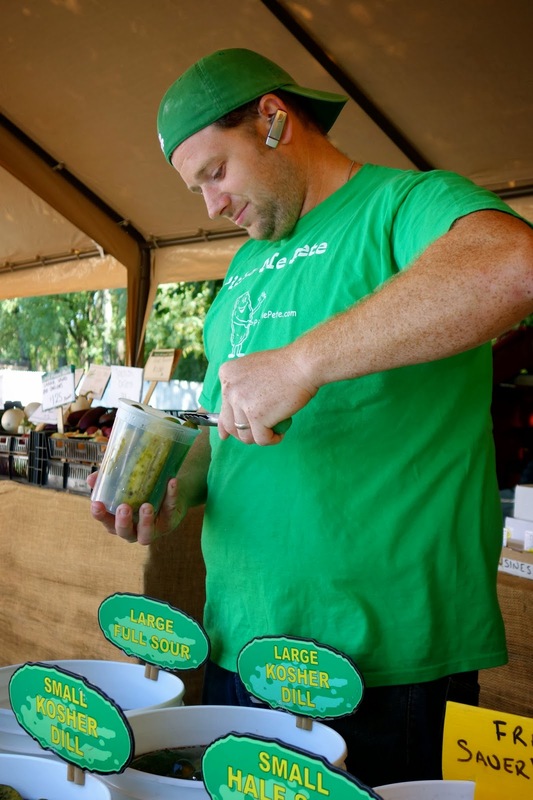 Former accountant Pete Starr of Plainview knew how to run the numbers, and now heads up Pickle Me Pete, a thriving artisan pickle business, selling bold, spicy pickles and fried pickles at local markets and online. I’m still debating my favorite holiday gift of the season just past. Was it the Blue-ray disc of the Doctor Who Fiftieth Anniversary special, or the membership in Zingerman’s Bacon of the Month Club sent by my pal, Zany in Chicago? With all due respect to the good Doctor (who has saved Earth’s bacon hundreds of times over), when it comes to indulgence and sheer crave factor, the Bacon of the Month Club has a lot going for it. Membership has its privileges. The first delivery comes with a tempting slab of bacon, and a collector’s manual containing a slew of bacon lore to pig out on. First up in the cavalcade of bacon is Nueske’s Applewood Smoked Bacon. Made by Tanya Nueske in Wittenberg, Wisconsin, Nueske’s is wet cured for 24 hours in a brine mixture with sugar and spices and then smoked over Applewood for 24 hours. It’s described as “meaty, pleasantly sweet and smoky. Bacon artisan Tanya Nueske says her grandfather started selling the bacon in 1933 and today she continues the craft of smoking. The bacon is smoked very slowly so that the flavor really permeates the cut of meat. 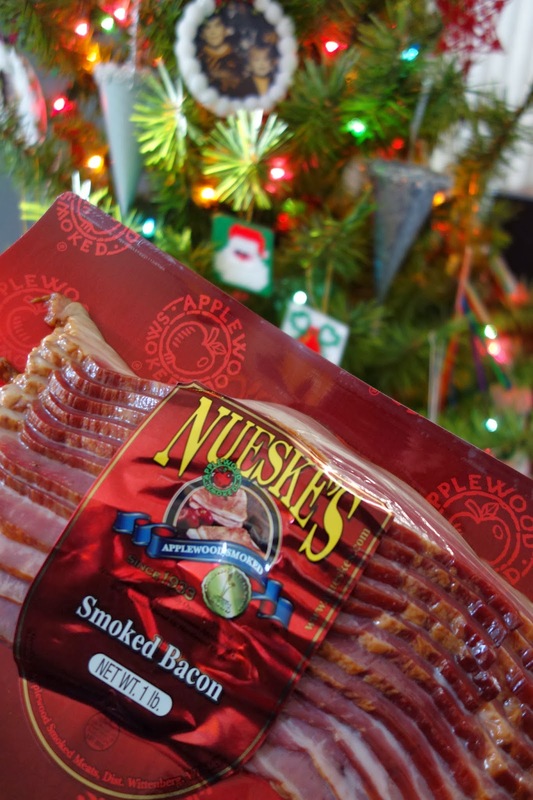 As the Nueske’s Applewood Smoked Bacon is a Christmas gift, I decided to incorporated it into my Christmas Day dinner menu, preparing Bacon Wrapped Potatoes. The recipe from Everyday Food can be found here. 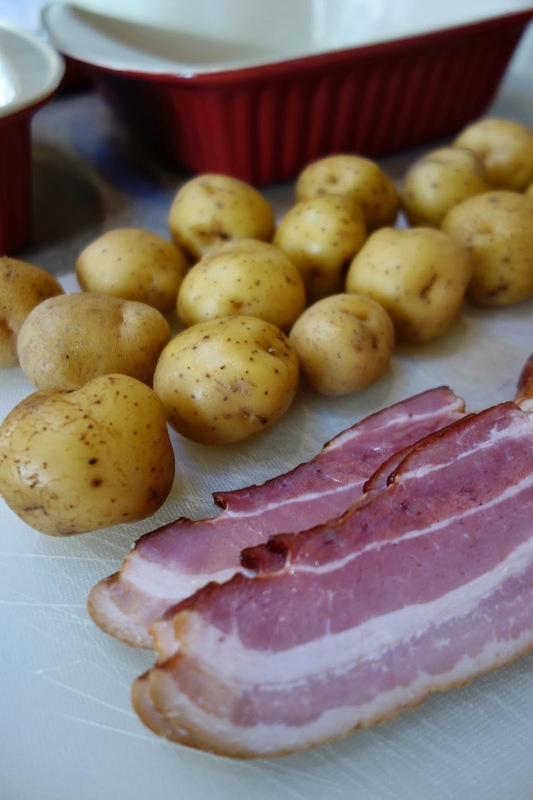 I wrap petite Yukon Gold Potatoes each in a ribbon of Nueske’s bacon, and bake in a 400F degree oven for 50 minutes. The Nueske's handles beautifully. Ah, the slick feel, the marbling, and the luscious layers of delectable bacon fat! During the baking time, insanity nearly sets in as the intoxicating sweet aroma of smoked bacon fills the house. The sound of "sizzle" and "pop" repeatedly draws me back to the oven to peer in. It is a miracle that I actually manage to refrain from sampling before Christmas dinner is served. Hot from the oven, the Bacon Wrapped Potatoes are kind of like glistening little Christmas gifts! I know the tradition is “visions of sugarplums,” but as I gleefully anticipate the next Zingerman's Bacon Club delivery, there are visions of bacon strips dancing through my head!